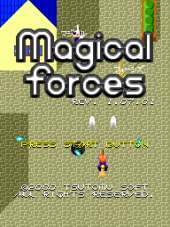 Vertical scroll shooting game where you are a witch riding a broom, with seven levels to play. The player character has an ear and a cat ear. New characters have been added (provisional), but still they have ears (a dog ear, a squirrel ear, a rat ear). There is no power-up or bomb, and it has a strange system that kills enemy bullets by shooting for sub weapon. The degree of difficulty can be selected from 5 levels from EASY to CRAZY, and it can be played from the beginner to the hot shooter. In addition, there are special attacks that can be played simultaneously by two players, and can only be played simultaneously. This works only with WindowsGDI. Therefore, it operates comfortably even on machines with low CPU power (minimum operating level is 80486-75 MHz). The screen size is 1x mode (192 x 256) or 2x mode (384 x 512).